Premium luggage brand partners Europe's biggest handball event, the VELUX EHF FINAL4, which takes place 28 and 29 May 2011. RIMOWA, one of the world’s leading manufacturers of luggage, has been named as an official partner of the VELUX EHF FINAL4, the final phase of the VELUX EHF Champions League. The new deal, signed just a few weeks before the highlight of the VELUX EHF Champions League 2010/2011 season throws off, will see the Germany-based company presenting its brand at the VELUX EHF FINAL4, the biggest club handball event of the year, which takes place in the LANXESS arena, Cologne on 28 and 29 May 2011. RIMOWA will supply its distinctive cases to the winning team of the VELUX EHF Champions League and will be present on court through the supply of cases for team medical staff of all four participating teams at the VELUX EHF FINAL4 event. The international brand will be presented on backdrops and in promotional materials. The company will also produce two very special and individual cases for the VELUX EHF FINAL4, a carrying case for the VELUX EHF Champions League trophy and a case for the VELUX EHF Champions League Top Scorer trophy. 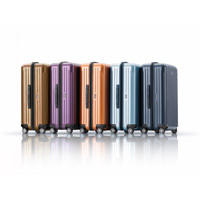 RIMOWA was founded in 1898 by Paul Morszeck in Cologne, Germany, and counts among the premium brands for cases made of aluminium and the high-tech material polycarbonate. RIMOWA is one of the few manufacturers producing luggage in Germany. For RIMOWA “Made in Germany” means excellent materials, brilliant technology and extraordinary design with the highest quality of workmanship. The traditional company based in Cologne sells its products globally in more than 65 countries.